The increase in health funding primarily benefited hospitals and health care systems. several grants over $150,000 supported the acquisition of new equipment to serve rural residents, upgrade maternity services and expand primary care clinic usage of data for improved patient outcomes. K-12 education also experienced a significant increase in funding, which was up $7.6 million (120%), largely due to a multi-million dollar grant to the idaho state Department of education from the J.A. and Kathryn Albertson Foundation. Human services funding was up 58% due to a single, $3 million gift from the Idaho Community Foundation to the Treasure Valley YMCA. Despite these gains, overall funding to the state declined by over $10 million (-18%). 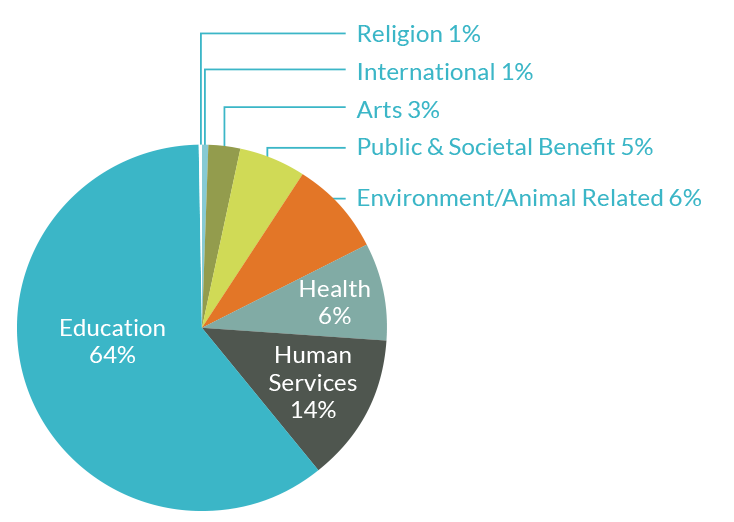 Community economic development and higher education organizations were the most impacted, experiencing 92% ($3 million) and 59% ($21 million) decreases in funding, respectively.